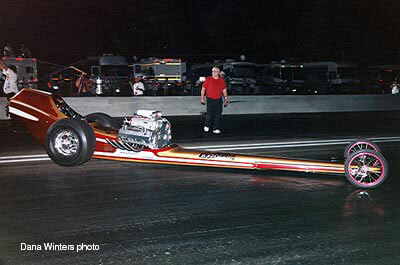 This page chronicles the history and restoration of "The Assassin" Top Fuel dragster, which, to this day remains the only Cacklecar with a SOHC Ford engine. 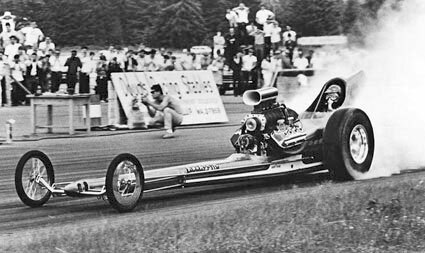 Also, it was and is one of the most beautiful dragsters ever built and raced in the Northwest... or anywhere else for that matter. 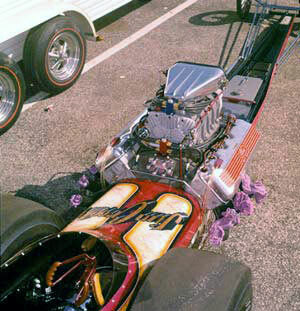 The 1968 Winternationals marked the cars National Event debut. 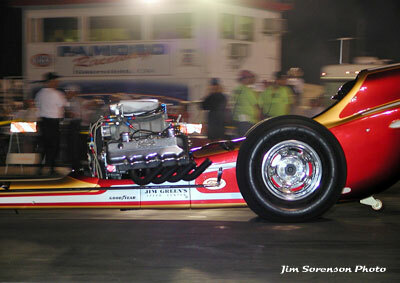 With Bob Muravez in the seat the car spun a tire on the rim ripping a tube causing the car to shake quite badly doing major damage to the body ( the tail was not on the car at the time ). Tom (Hanna) had to do a lot of repair work to the body and the car was repainted with a different scheme - the one seen in most pictures from the era. 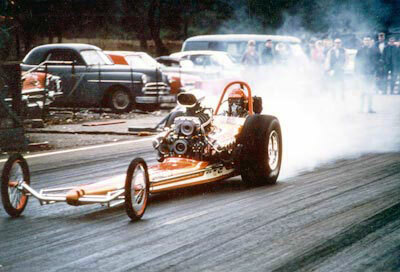 Crooke ran the car at all the major winter races and then returned home to Seattle for the northwest season. 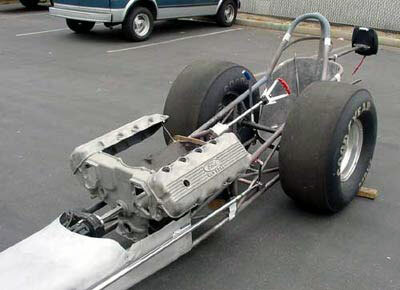 As the tires and clutches got better and the ET's quicker the Ford motor began breaking the block on a regular basis. 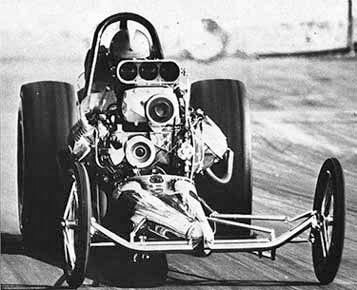 In May of '68 Crooke made the decision to convert the car the early hemi power - using stroker 354 - either 3/8 or 5/8 cranks. 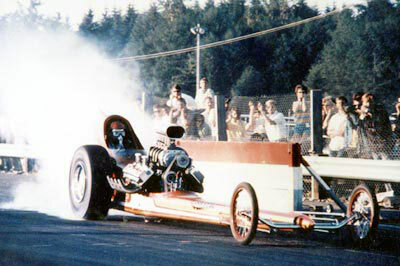 The car was raced this way for the rest of the time he had it including several trips to California for events like the PDA Race (above). July of 1968: SIR, WA. 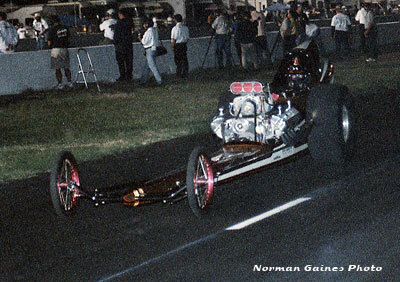 The Assassin with Gaines Markley driving. 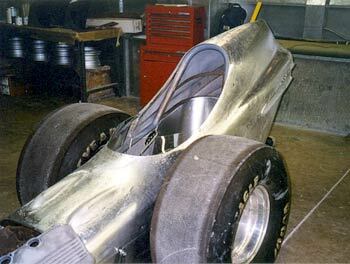 The car was ordered in July of 1967 by Jim Crooke who visited Don Long, Tom Hanna, George Cerney Jr, Ed Pink and George Klass ( P&G Trailers ) and discussed how they were going to build the car/engine/trailer. 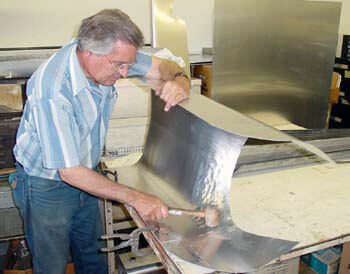 Don Long: The original order shows a 180" wb ( I remember as 185" ) - actual is 183". 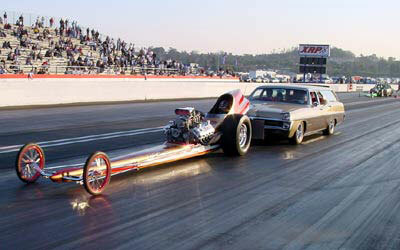 The car is narrower than a standard Chrysler powered car of the era by about 1". 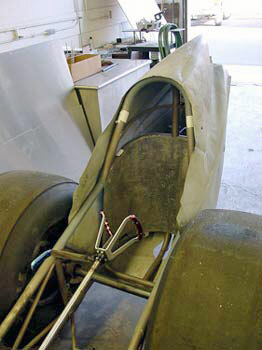 The car was ordered with a foot brake to be used in the shut off area as well as turning around on the starting line after push starting as starters were not yet being used - a feature Don had built on the Baney & Prudhomme car. All the aluminum parts were anodized red with the mag parts Dow 7 treated. 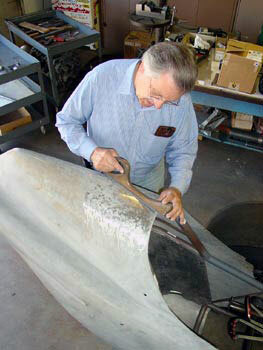 Tom Hanna: The body was designed to be used several ways.Tail section ( one of the last to be made by Tom ) with the nose piece. 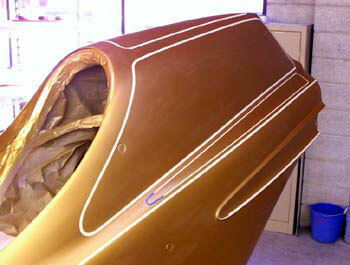 Tom also built a 2nd cowl and side panels behind the rear end to be used with out the tail section - this cowl had the "foot bumps". 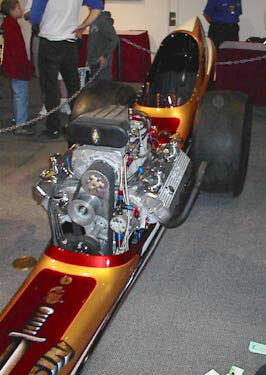 Tom also made a set of engine side panels to be used if the nose piece was not on the car but the car was never raced in the shorty body configuration. George Cerney/Tom Kelley: George and Tom had done the paint and lettering on Crooke's Woody top gas car so he went to them for this project. They discussed various colors etc. 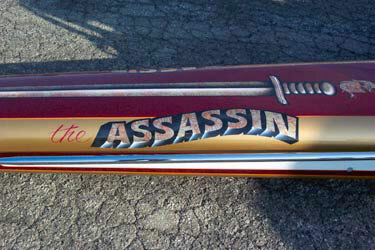 and Crooke shared with them that he was going to name the car The Assassin - in and era of Kings (i.e. Jerry Ruth) etc. he thought this an appropriate name. 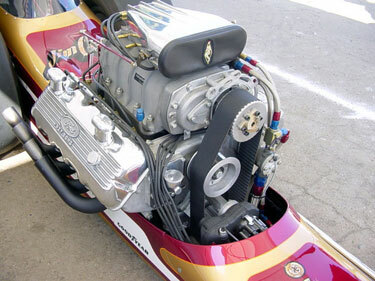 Ed Pink: The engine was ordered as a duplicate to the Baney & Prudhomme car including Mag blower manifold, VanCharger supercharger, Enderle injector etc with a complete selection of spare parts for racing in the northwest. The original estimated completion date was to be in October. 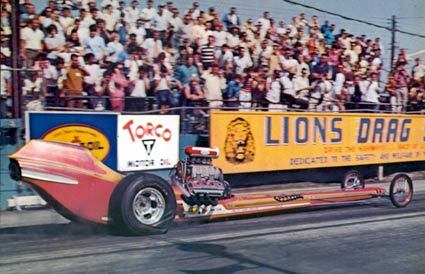 Like all projects completion was a little later - the car first ran in December of 1967 with Bob Muravez (aka Floyd Lippencotte) driving. 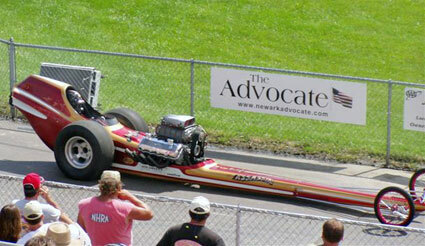 The 4th run on the car produced an ET of 6.98. 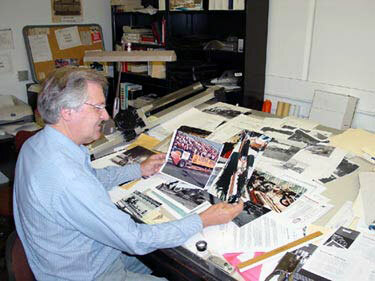 In the fall of 1968 Crooke decided to return to school at the University of Washington. He also decided to sell the Assassin. 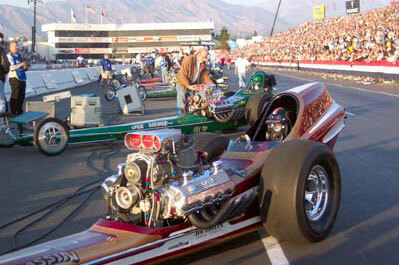 The car was sold to Bob Painton and Pete Reimer of Vancouver BC. 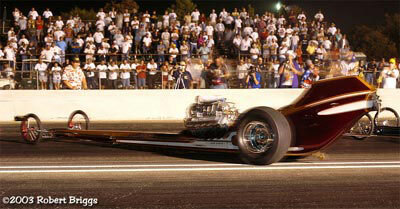 33 years later Crooke renewed his interest in drag racing after spending endless hours on WDIFL.com. 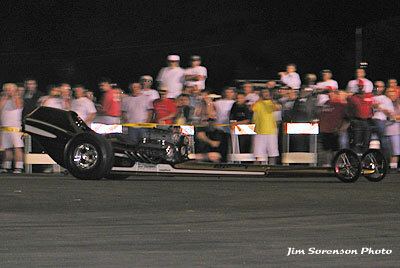 Looking at all the pictures on the site brought back many great memories. Crooke found many shots of his close friend, Jerry Ruth and pictures of the Assassin. 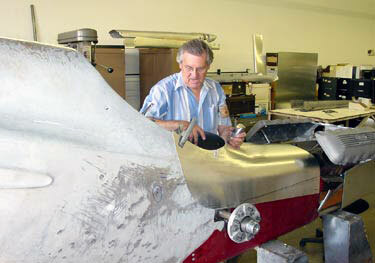 This rediscovery of old friendships and WDIFL gave Crooke a desire to see If he could locate his old car. Since the car was sold in Canada that's where Crooke started. Don Ewald told Jim that he had some connections in Canada and would see what he could find out. Crooke was surprised several weeks later when Ewald forwarded to him an e-mail from Steven Kendall from Pentection BC saying that he thought he had the Assassin. 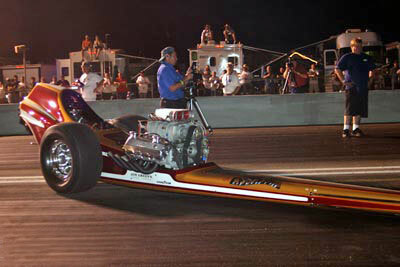 Steven was racing the car with a Chevy and a powerglide transmission. Jim called Steven right away. They quickly determined that this was indeed Crooke's old car. 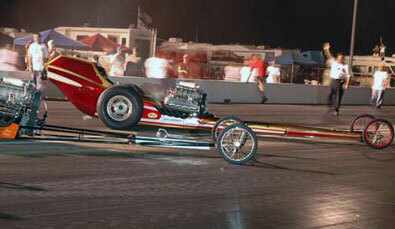 Jim attempted to purchase the car sight unseen but Steven was still enjoying racing it. He did assure Crooke that if he did decide to sell the car he would call him first. This was in the spring of 2001. In October of 2001 Crooke got a call from Jerry Ruth who had been talking to Jim Green, the owner of Jim Green's High Performance Center in Lynnwood, Washington. 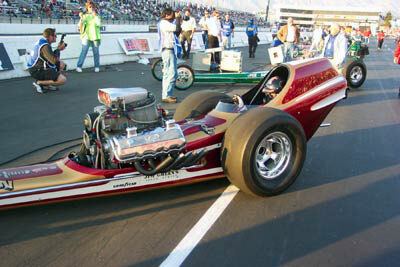 Green had been a very successful drag racer for and number of years and was now collecting Ford 427 SOHC engines. 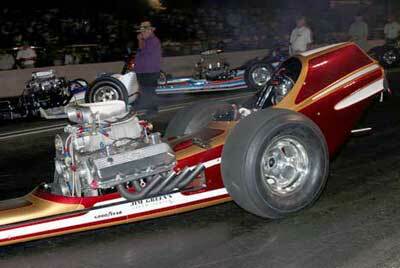 After attending the 2001 CHRR Green decided he'd like to restore a Cacklefest car but one that had a cammer. 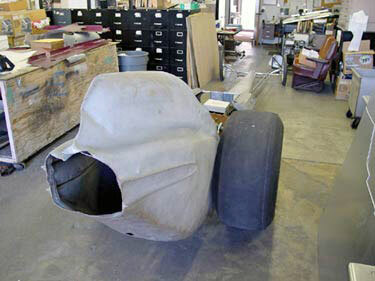 Ruth told Green that Crooke had located the Assassin and suggest that would be a perfect car to restore. This began to seen like a project that was meant to be! Green and Crooke discussed the project and how they would to do it. Green decided to proceed with the project with assistance from Crooke. At this point they had to figure out how to get the Assassin from Seven Kendall in Pentiction BC. 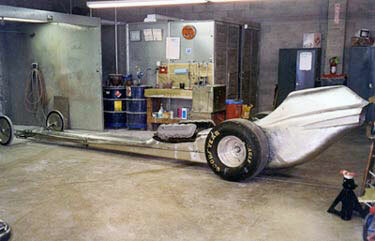 As they say, money speaks louder than sentiment and by early 2002 they had the car back and the chassis repaired. Green was able to find a set of Boranni rims with Don Long style hubs for the front end - a great find. 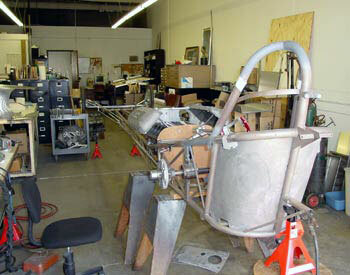 In May they took the chassis to LA for Doug Kruse to do the body restoration. 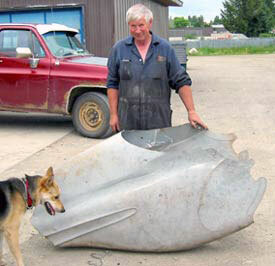 In June Crooke got a phone call from Pat Wilkinson of Prince George BC Canada saying that he had found the original tail section of the Assassin! 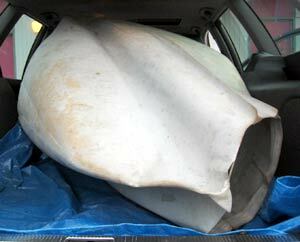 The tail was found in the woods out behind a shop in Prince George BC - reported with some dents and snow damage but repairable. 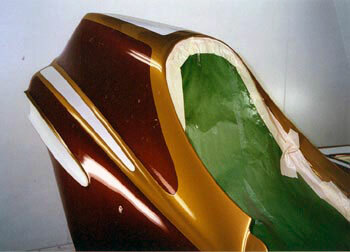 That gave Green and Crooke the complete original frame and body. A friend of Jim's picked it up in Canada (below) and it was then shipped to Kruse. 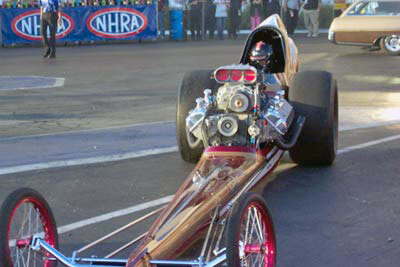 Pat would not accept any money for his discovery - a true hot rodder. Doug Kruse pored over dozens of photos he relied on to make sure the Assassin restoration was perfect. 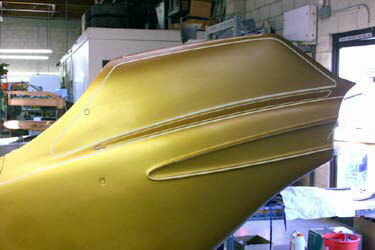 Not having to recreate the original tail piece made the project much shorter than it would have been. Obviously it needed some TLC from Doug's crafty hands, but all things considered it was in pretty good shape. These shots how bad the body really was as Doug runs the file over the aluminum which shows all the high and low spots. 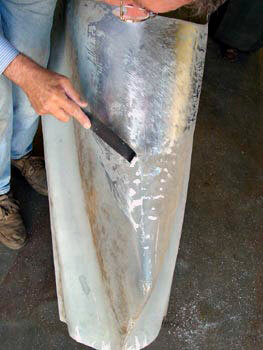 He then pounded them out, tweaked the shape and smoothed them. The shiny areas are what he already fixed. 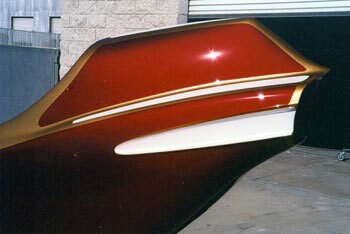 By September of 2002 with the tail piece repaired the rest of the car was ready for tin. 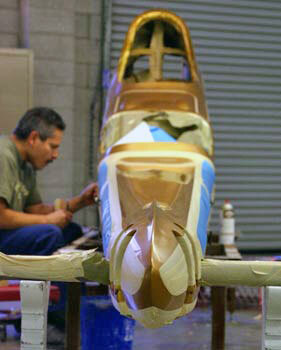 Once the body is done Mick Jenkins of So-Cal Speed Shop is going to do the paint job. 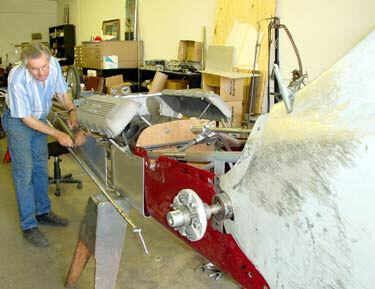 Pat Foster recreated the original Don Long steering wheel, levers and pedals. 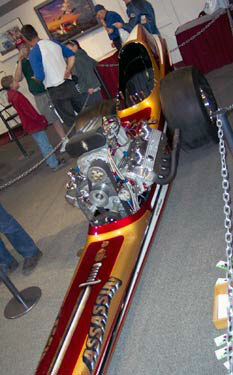 The Assassin made its herald debut at the Wally Parks NHRA Motorsports Museum during the 2003 Winternationals. 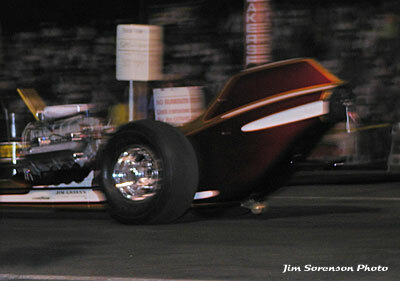 On Sunday, between the semis and final rounds of the NHRA Winternationals with Jim Crooke driving, the car made its first "cackle" appearance. 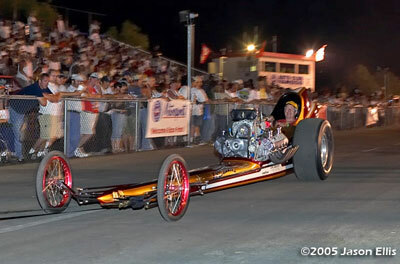 The Assassin made its CHRR Cacklefest debut at the 2003 CHRR and has been a staple there and at other events ever since. 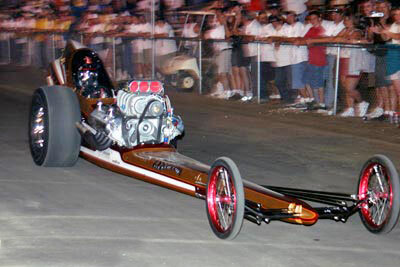 In the summer of 2004 the Assassin made a mini-tour back east and, among other things, did this push start cackle at Indy.